I decided I was going to eat better and cook more. So there I was trawling through my recipe books, my recipe folders on my PC and the Internet, when I discovered a recipe for Portuguese Kielbasa & Kale Soup. For some reason, my first thought was ... eh? This sounds more Jewish to me ... the kielbasa perhaps? Or does it sound more Southern .. must be the kale. Then I remembered that I have a packet of mixed sausages in the freezer from a forgotten and misbegotten idea of midnight feasts of sausages and eggs. Well, this is promising then. There were only a couple of catches. 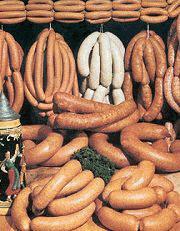 One, I had mixed sausages, not kielbasa. Never mind, creativity and versatility are my middle names ... after glutton. Two, I don't think you can get kale here. Oh well. I have sausages and I am gonna use them if it kills me. Off I troop to Carrefour. For some misguided reason, I thought it might be quiet as it's National Day. Wrong! Sigh. Gamely, I arm myself with a trolley. The large one, not those wimpy, half-baked, no-bottom ones. As I suspected, they do not have kale. I decide that kai lan would be a half-decent substitute. Except I cannot find the kai lan! What kind of supermarket is this??? Oh wait ... a French supermarket in Singapore. Silly me. I did find those baby kai lan packets and took one just in case. I finally spotted some kai lan hidden bashfully behind an over abundance of chye sim. And well they should be ashamed! They were yellowed, limp and looked like they came by way of Afghanistan! Bullet-ridden .. what is with the holes??? I throw them back in disgust. The woman next to me shuffles away, casting wary glances at me. I trundled off in disgust and catch some loud woman hollering like a fishmonger at the end of the aisle. Wait .. it is the fishmonger. Apparently they have a promotion for 3 fishes of any kind for $12.90. Cool! Was not planning to have fish till the weekend but if the fish was fresh and good, I can always freeze them. Happily I walked up and ... what's this? Catfish! Score!!!! Memories of my uncle's fabulous Chinese herbal catfish soup are literally tickling my tastebuds. I finally buy my catfish despite the fishmonger's attempt to dissuade me. She'd taken one look of me and came to the erroneous conclusion that I was a fit freak. "The catfish is too oily and fatty for you. You won't like it," she says kindly. Bring it on!!! Anyway, I get the catfish and a sea bass which I was going to make into a Chinese herbal soup later. She recommended a fish that looked like a tanned and muscley pomfret at a quick glance. Kingfish. Beer? Eh ... "How do you cook it?" I ask. Apparently you can steam it or cook it in soup. OK, always game to try something new. I get home and decided to do some research about this kingfish. Bugger! Double bugger!! Apparently the best way to prepare kingfish is to have it raw. Now you tell me??!! After I'd frozen it. Sigh. Oh well, I'll go Indian on it then .. or maybe Thai. We'll see. There you go. I was rather pleased with my soup and I even had enough to pack a small tupperware - leftover soup is the best! I can't wait. I had 2 bowls - such restrain *failing to mention the size of bowls* - followed by really yummy grapes from the US I got from Carrefour. $2.90 for a nice pack. Sweet! All in all, I would rate the soup a 7/10 for taste and heartiness and maybe a 8/10 for health-worthiness. It really depends on the sausages you are using and also the amount of oil you use.